Wednesday classes at KAPU have been suspended for the time being. Please check the "Notice Board" on the Home page for possible last minute changes. 1. John Lewis's car park. 2. Fitzhamon Embankment, CF11 6AN. 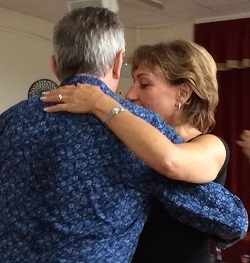 Monthly Workshops & Tea Dances @ Morganstown. Usually the last Sunday of the month. Workshop for all levels with Eduardo 3.00pm - 5.00pm. Dancing & Tea 5.00pm - 8.00pm. Workshop, dancing & tea £14.00 per person. Workshop only £12.00 per person. Dancing only £8.00 per person. 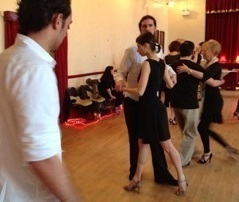 Sunday 28th April 2019 with EDUARDO & Easter Tea Dance. Sunday 26th May 2019, with EDUARDO. Sunday 30th June 2019, with EDUARDO. Sunday 28th July 2019, with EDUARDO. Essentials class	for all levels 8.15pm. All classes are run on a drop-in basis. Free parking on adjacent streets after 18.00. This is a link to the Tango Alchemy web site.